Work time. The ProBook 6465B-LJ489UT shares the model name of the ProBook 6465-LY433EA, and it's largely the same situation on the inside. HP's latest business notebook features entry-level specifications, but a competitive price tag. 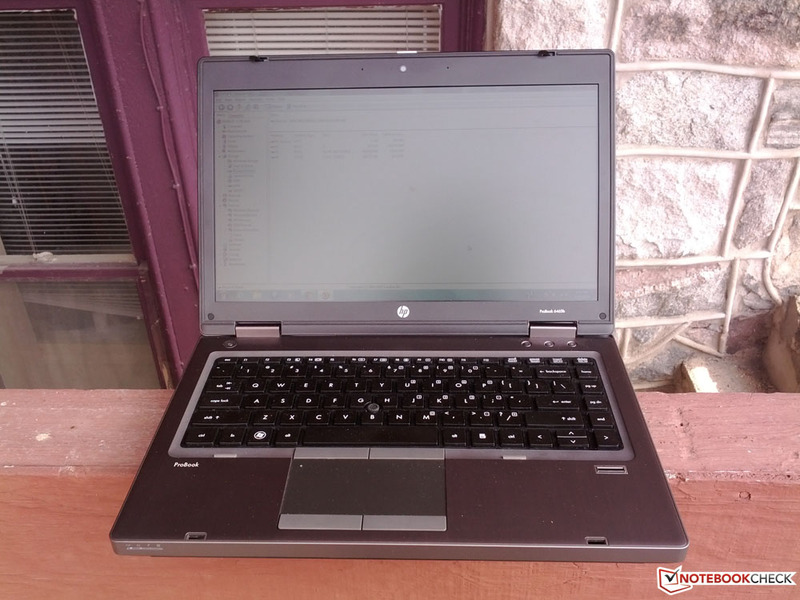 If the HP ProBook 6465b looks familiar to you, it’s certainly understandable. 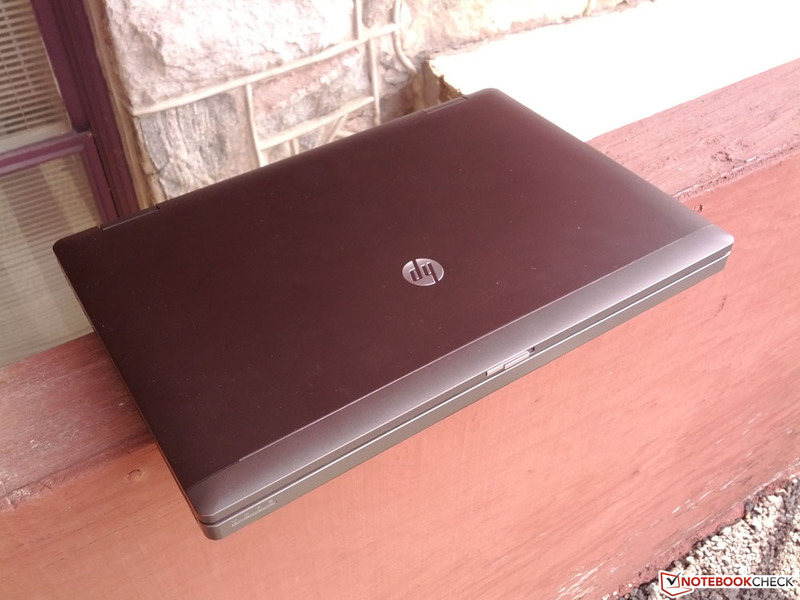 Back in January, we reviewed the HP ProBook 6465b-LY433EA and found it to be a fairly capable — if cost-restrictive — business notebook. 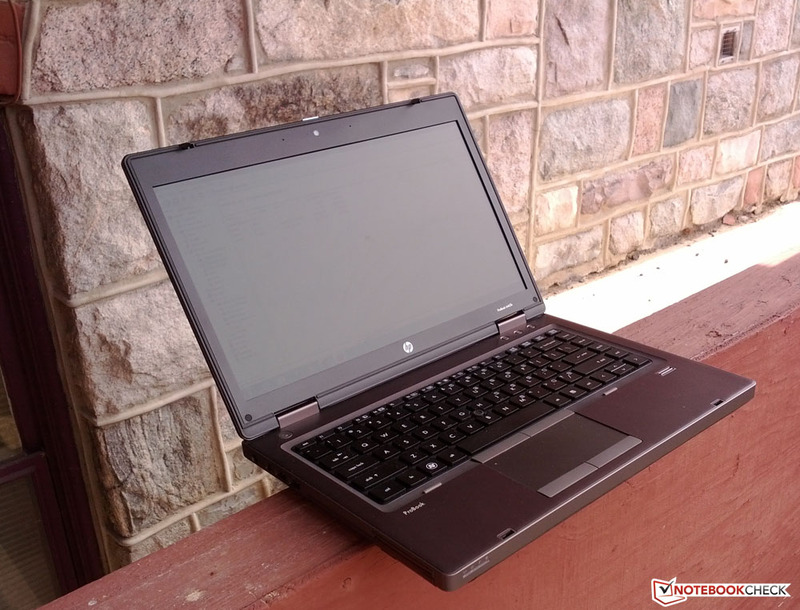 This iteration of the ProBook 6465b doesn’t vary too drastically, as the notebook features the same plastic and metal exterior, along with identical connectivity options. In addition, the keyboard deck and chassis are all the same.The big differences come in with the 6465b-LY433EA’s internals — it is based upon the AMD A4-3310MX CPU and features an integrated ATI Radeon HD 6480G GPU, among other internal changes. Despite the lack of major updates, though, is the HP ProBook 6465B-LJ489UT worth a purchase? Read on to find out. At 14 inches and 1366 x 768 pixels, the ProBook’s display doesn’t have immediately impressive specifications, but its performance is respectable. 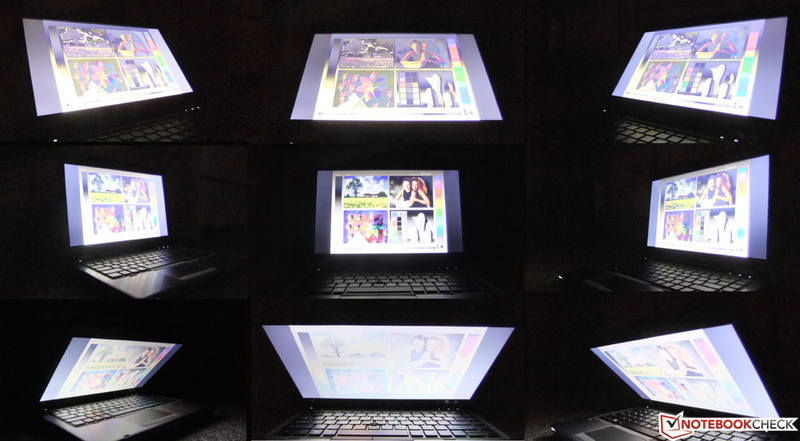 As our brightness analysis shows, the ProBook 6465B-LJ489UT’s display maintains a somewhat below average brightness distribution throughout all nine quadrants. The 6465B-LY433EA’s average brightness of 206.8 cd/m2 is only marginally lower than the ProBook 6465B-LJ489UT’s average brightness of 212.6 cd/m2. However, the LJ489UT's brightness on battery was significantly lower (212 cd/m2 versus 143.8 cd/m2). 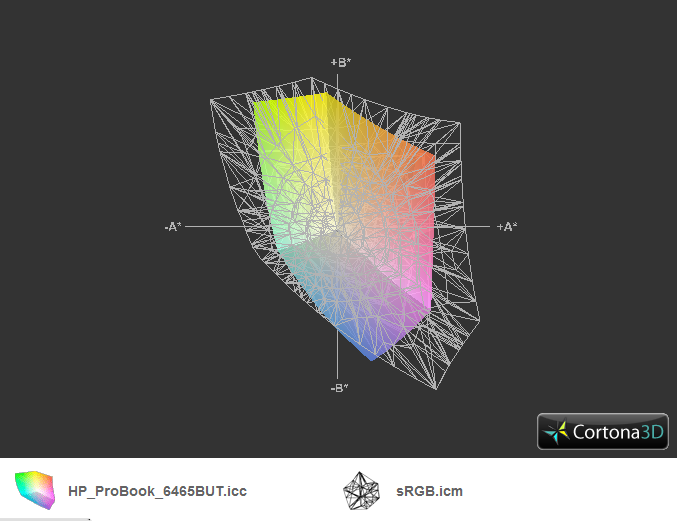 The ProBook 6465B-LJ489UT’s color coverage capabilities are less spectacular. 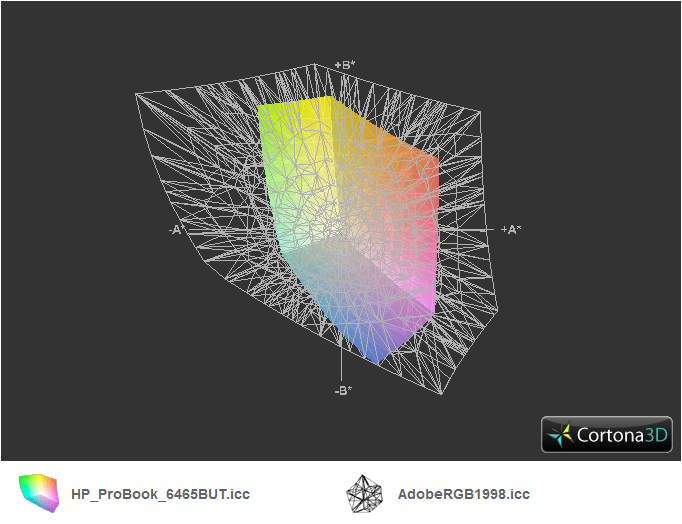 Against Adobe RGB and sRGB, there were significant gaps in coverage. In outdoor situations, though, the ProBook’s antiglare display works fairly well. During overcast and direct sunlight situations, we were still able to see onscreen details, though visual fidelity takes a minor hit. The ProBook's non-glossy display compensates for a loss in visual fidelity while outdoors. Viewing angles are also as expected. At normal viewing angles, visual distortion was minimal. However, tilting the laptop’s display quickly results in color inversion and other visibility issues. Surprisingly, the ProBook 6465B-LJ489UT’s comes with little unnecessary bloatware. 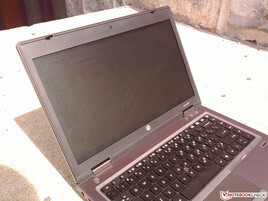 HP has only bundled a few software packages, including Norton Internet Security and various HP branded utilities. Most of these programs are monitoring applications for functions such as power and security management. On paper, the ProBook 6465B-LJ489UT features components in line with most entry-level 13-inch business notebooks. 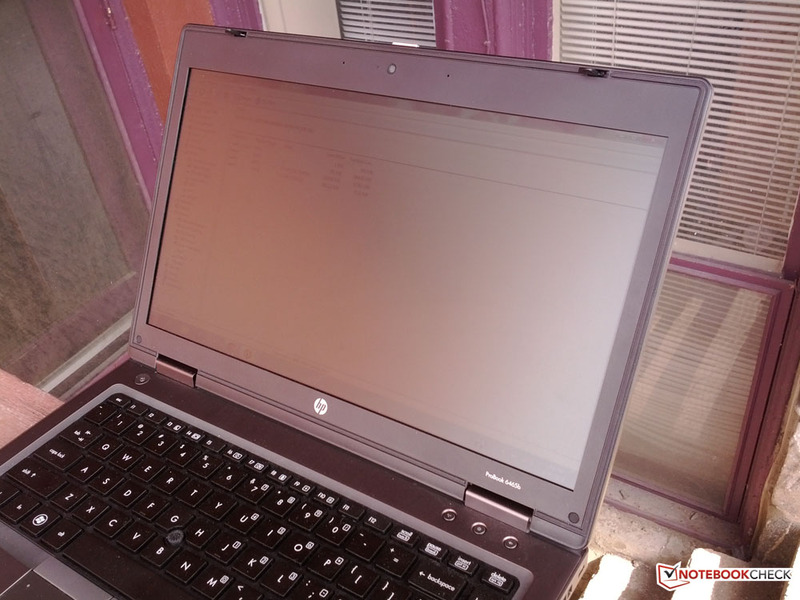 Beyond the previously mentioned 2.1 GHz A4-3310MX and ATI Radeon 6480G GPU, our review unit also came equipped with 4GB of DDR3 1333MHz RAM and a 320 GB 7200 RPM hard disk drive. 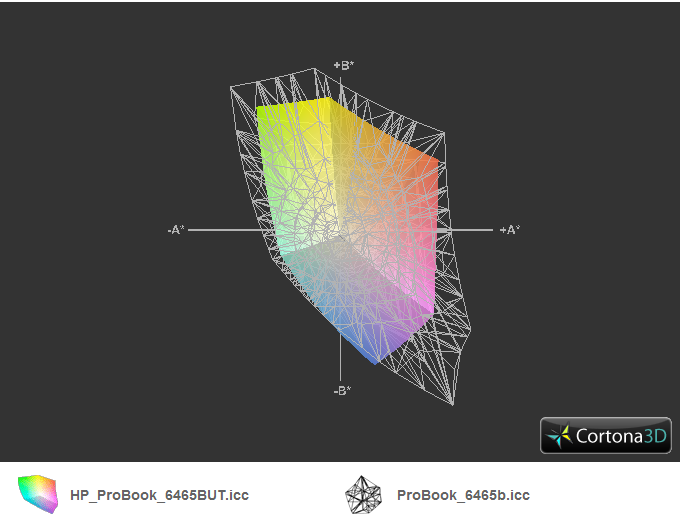 The ProBook 6465B-LJ489UT internal specifications are also within throwing distance of the ProBook 6465B-LY433EA. Compared to the ProBook 6465B-LJ489UT, the ProBook 6465B-LY433A features an AMD A6-3410MX CPU with an integrated Radeon HD 6520G GPU. In practice, though, our benchmarks show that the ProBook 6465B-LJ489UT struggles to keep up against other notebooks that feature comparable internal components. In Cinebench 10 and Cinebench 11.5, the ProBook 6465B-LJ489UT’s scores were respectable, but regularly fell behind the scores of its competitors. Interestingly, the ProBook 6465B-LJ489UT’s scores were mixed compared to the ProBook 6465B-LY433A — 64-bit scores for the ProBook 6465B-LY433A were 2190 points, 7209 points, 3327 points, 2.01 points, and 13.17 frames per second. This was due, in part, to several differences between each CPU. While the LJ489 relies on a dual-core APU compared to the LY433A's quad-core APU, its higher clock speed results in the higher test-by-test score. However, the ProBook 6465B-LY433A and ProBook 6465B-LJ489UT both managed to eke higher Cinebench 10 and Cinebench 11.5 OpenGL rendering scores than other similar notebooks. For instance, both ProBook 6465B models scored around 13 frames per second in Cinebench 11.5’s OpenGL test — by comparison, the Intel HD Graphics 3000/Core i3-2310M Acer Aspire 3750-2314G50MNkk only scored 8.63 frames per second. 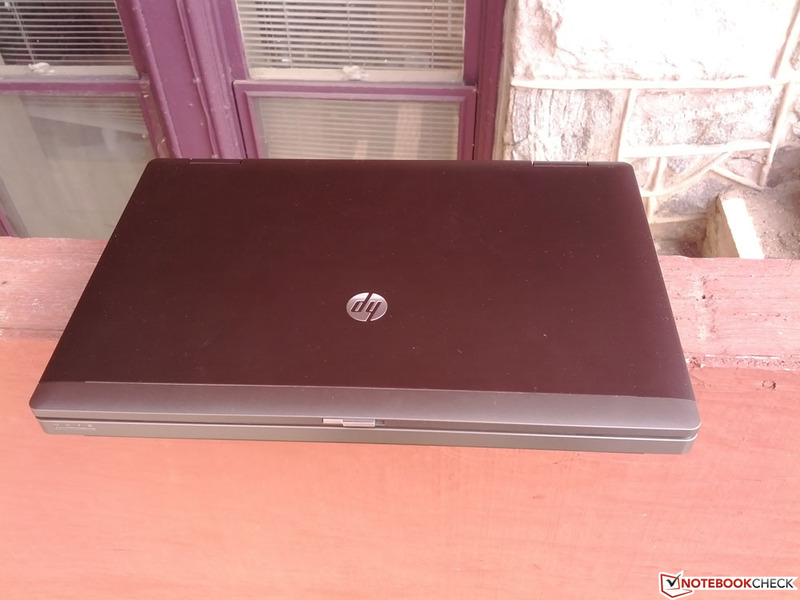 Against comparable Intel-centric laptops such as the Core i3-2310M/HD Graphics 3000-based HP ProBook 4430s-XU013UT, though, the ProBook 6465B-LJ489UT was blown out by considerable margins in our PCMark Vantage and PCMark 7 benchmarks. In each program, the ProBook 4430s-XU013UT scored 5303 points and 1995 points, respectively. In addition, the Toshiba Portege R830-110 saw a similarly high PCMark Vantage score of 5186 points. Within wPrime and Super PI, benchmark results were similarly unexceptional. In both benchmarks, the ProBook's scores were nowhere near those for current Core-i3 based notebooks. For instance, in wPrime's 32M test, the ProBook's score of 41.5 seconds was closest to the Core 2 Duo-based HP EliteBook 2530p (41.9 seconds) and the AMD Athlon II-based HP Compaq Presario CQ62-A04sg (40 seconds). With its standard SATA-based hard drive, the ProBook 6465B-LJ489UT also made few surprises throughout the rest of our testing. During CrystalDiskMark 3.0 and HD Tune testing, performance scores were virtually identical to other non-SSD hard disk drives in laptops such as the Lenovo ThinkPad Edge E320. DPC Latency Checker performance featured similarly few surprises. No major peaks or jumps were seen. In 3DMark testing, the ProBook 6465B-LJ489UT was much closer to its immediate competitors, scoring within extremely close margins to other Intel HD Graphics 3000 based notebooks. By comparison, in 3DMark 06 and 3DMark Vantage, the Intel HD Graphics 3000-based ProBook 4430s-XU013UT recorded scores of 3498 and 1504 points, respectively. Surprisingly, even the ProBook 6465B-LY433A — despite touting an ostensibly better GPU with the AMD Radeon HD 6520G — featured benchmark scores that were virtually the same as the ProBook 6465B-LJ489UT in 3DMark 06, 3DMark Vantage, and 3DMark 11 (3322 points, 1588 points, and 552 points, respectively). After stress testing the ProBook 6465B-LJ489UT and running 3DMark 06 a second time, we also saw no signs of performance throttling. Both the A4-3310MX and Radeon GPU ran at their advertised speeds. The ProBook 6465B-LJ489UT’s ATI Radeon HD 6480G is intended to provide more graphical processing power when compared to other integrated graphics solutions. In practice, though, the picture is somewhat mixed. While the HD 6480G can provide passable performance in older titles, it is incapable of providing adequate frames per second in more recent titles. For instance, when the ProBook 6465B-LJ489UT was set to low graphics settings in F1 2011, the notebook performed smoothly, though barely past 30 frames per second. Once the graphics settings were increased within F1 2011, frame rates quickly nosedived. In newer games such as Alan Wake and The Elder Scrolls V: Skyrim, the HD 6480G saw similarly immediate performance struggles. in both titles, the ProBook 6465B-LJ489UT was unable to come anywhere near 30 frames per second at the lowest possible graphics settings. Once graphics settings were increased, both titles quickly became unplayable due to nearly single-digit frame rates. 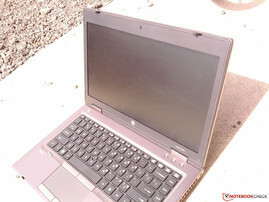 In spite of the ProBook 6465B-LJ489UT’s relative bulk and numerous ventilation points, the notebook was largely quiet. During casual usage, the notebook consistently operated at a low hum. The only point where the fan became noticeable was during stress testing — the fan was easily audible when we stood several feet away from the notebook. Still, it'd be a stretch to call the ProBook 6465B-LJ489UT's fan consistently noisy. When the notebook was idled or used for casual Internet browsing, the fan operated at a virtually inaudible whirr. Even during times when the disc drive was in use, the fan noise remained largely unchanged. While we wouldn't bring the notebook into a quiet area when it's under load, it's not much louder compared to any comparable 14-inch entry level notebook. Thanks to the numerous fan grilles placed around the ProBook 6465B-LJ489UT’s chassis, heat dispersion is incredibly efficient for the notebook. As always, we ran the ProBook through a standard temperature stress test — Furmark and Prime95 were run simultaneously for 60 minutes and temperature measurements were taken at the start and end of the hour. Clearly, the power supply should be kept in a well-ventilated area — the power supply saw a 10.4-degree jump in temperature after an hour. Fortunately, this was as hot as the ProBook 6465B-LJ489UT got — with few exceptions, the entire notebook stayed at around a relatively balmy 30 degrees Celsius following the stress test. Impressively, the area near the fan’s exhaust grill — the hottest part of most any notebook — peaked at an equally impressive 33 degrees Celsius. (±) The average temperature of the palmrest area of similar devices was 28.2 °C / 82.8 F (-1 °C / -1.8 F). Even by the generous standards that most notebook speakers are judged by, the ProBook 6465B-LJ489UT’s speakers leave a lot to be desired. The ProBook only relies on a set of tiny speaker grilles near the front of the notebook, and appropriately, they produce equally unremarkable audio. We ran multiple genres of music through the speakers, including The White Stripes’ “Icky Thump” and LCD Soundsystem’s “Yeah (Crass Version)”. Audio fidelity was extremely poor, as highs were reedy and thin. In addition, bass and low-end aspects of a song’s mix were virtually nonexistent. In conjunction with the speaker’s low volume output, headphones are definitely recommended on the ProBook for any type of audio. The ProBook features a removable 55Wh battery. 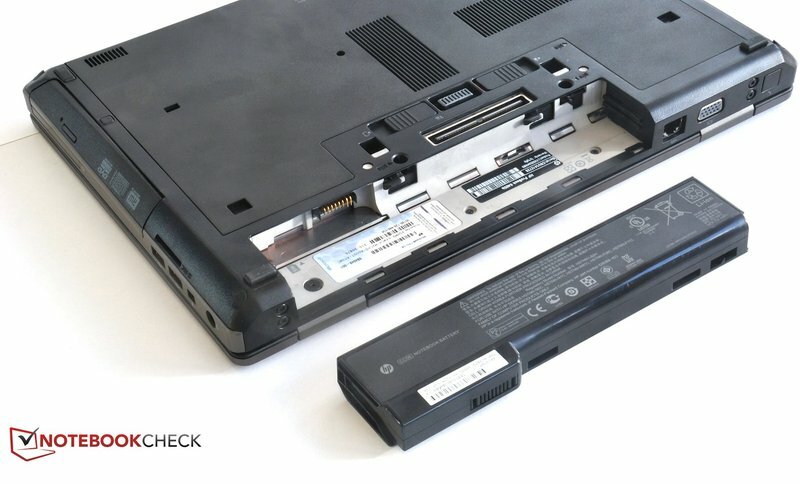 The ProBook 6465B-LJ489UT’s 55Wh battery clocks slightly below batteries from competing laptops such as the Lenovo ThinkPad Edge E320 (63Wh) and Dell Inspiron 14z (65Wh). Still, the ProBook’s battery managed to remain marginally competitive against similarly built notebooks. On the inside, the ProBook 6565B-LJ489UT's battery touts specifications that are to expected for an entry-level notebook. The HP CC06XL battery touts a six-cell structure and adds an additional .72 lb (.323 kg) to the ProBook. During all four tests, battery life was measured with Battery Eater Pro. We placed the laptop in several different usage situations to find how long the battery would last under different but discrete conditions. Under idle usage — where the ProBook was left on at minimum brightness and with WLAN disabled — the laptop lasted for 7 hours and 21 minutes. This came in slightly above HP’s own maximum battery rating of 7 hours and 15 minutes. In other areas, performance left something to be desired. During our WLAN surfing test, which intends to simulate the load that basic web browsing would place on the battery, the ProBook 6465B-LJ489UT’s battery lasted for around four hours. Here, though, the battery’s limited capacity hit its first noticeable wall. During the WLAN test, the ProBook performed nearly identically to the Lenovo IdeaPad U400-09932DU (4 hours, 11 minutes), which touts both a Core i5-2430M CPU and a 54Wh battery. However, it also fell behind the similarly built Lenovo ThinkPad Edge E320. Although the ThinkPad features comparable internal specifications, the larger battery allows for it to garner a considerable lead against the ProBook 6465-LJ489UT — the ThinkPad pulled 6 hours and 58 minutes of battery life during its WLAN test. As their names might suggest, both ProBook 6465Bs share many things in common beyond aesthetics. The build quality remains similarly high on each model, but considering the assorted internal differences, the ProBook 6465B-LJ489UT is more of an expansion than a complete evolution within the ProBook line. And in terms of performance, this ultimately presents a mixed picture. Within the ProBook 6465B-LJ489UT, the AMD A4-3310MX CPU provides strictly entry-level performance. Cinebench 11.5 scores notwithstanding, benchmark results were largely near or below those from comparable Intel Core i3-based laptops. In addition, the ProBook’s ATI Radeon HD 6480G certainly makes it possible to play games other than Solitare, but the GPU’s limited processing power severely limits the notebook’s ability to run more recent titles. Against the Intel HD Graphics 3000 GPU, for instance, the advantage in gaming benchmark performance on the ProBook 6465B-LJ489UT was virtually nonexistent. At the same time, though, the ProBook 6465B-LJ489UT’s entry-level price tag ($649 USD) combined with respectable battery life and heat dispersion abilities add an important qualifier. Going strictly by performance benchmarks, the ProBook 6465B-LJ489UT doesn't possess an exceptional advantage when placed next to a comparable Intel-based counterpart. But at a relatively competitive price, the notebook offers a compelling alternative for consumers who place cost over performance. And, really, that sums up what you'll be getting from the ProBook 6565B-LJ489UT. 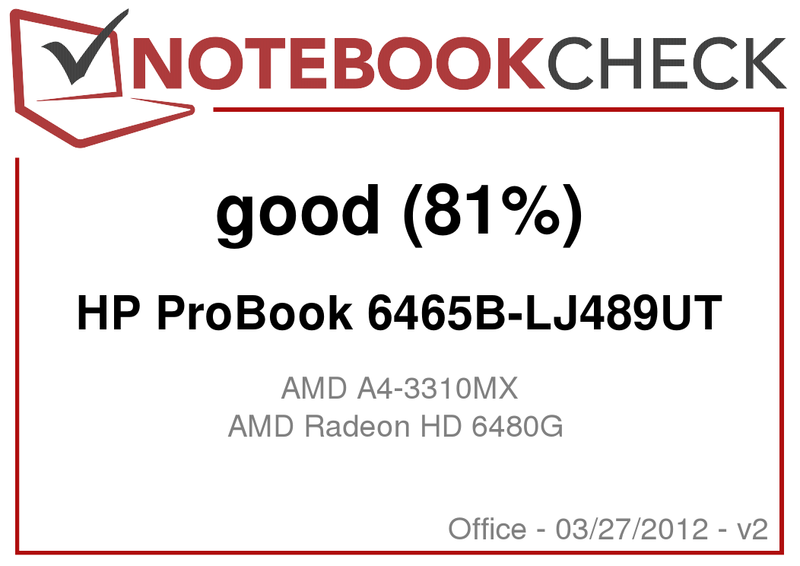 While the ProBook’s AMD A4-3310MX CPU and integrated ATI Radeon HD 6480G GPU might not raise any eyebrows, the notebook’s competency virtually everywhere else makes it a consistent — if unimpressive — utility business notebook. ...and the non-glossy screen helps when outdoors. Good battery life and cooling capabilities. Performance that's closer to comparable Intel-based notebooks. The ATI Radeon HD 6480G's benchmark results.